Start this ONE habit now to increase your fat-burning potential. When it comes to your “metabolism” experts agree on very little. Which is unfortunate since it leads to YOU not getting anywhere, other than leading to MORE frustration and disappointment. I’m not going to get into the various theories on why or how your metabolism becomes slow, because I would never finish that article. All nutritionists would agree that a “slow metabolism” causes you to gain fat and makes it very difficult for you to lose weight. This is the number one sign of a sluggish metabolism: Your old weight loss “tricks” simply don’t seem to work anymore. You can’t just give up carbs for a few weeks and drop 10 pounds. We’ve heard this one for years: That losing weight is merely about calories in and calories out. So theoretically, it doesn’t matter WHAT you eat as long as you burn off more calories through exercise. Well, let me tell you, I’ve had clients who spend 2 hours a day on the treadmill and can’t lose weight. It’s NOT about calories: It’s about what foods you’re putting into your body. Exercise can help, as long as you’re eating the right foods, but you don’t need to kill yourself every day with 2-hour workouts. Something terrible happens when you severely restrict your diet. Your body goes into starvation mode. Because it’s not getting enough food, your metabolism starts thinking “hey, we haven’t had much food, so I’d better start storing everything just in case.” Your body is actually trying to save your life! Instead of burning fat for fuel, it stores fat for the future. Not what you want! You actually need to feed your body and your metabolism to lose weight. The key is feeding it the right foods that stoke your metabolic fire. Every women has “trouble spots” — the little bulges where we always tend to gain and lose weight. But if you’re starting to gain fat in new areas, this could be a sign of a sluggish metabolism. Your body is searching for new areas to store fat. Fat around your midsection, for instance, can mean your cortisol levels are out of whack. When your metabolism is over-taxed, or you’re stressed out, your body pumps out extra cortisol, a hormone that tells your body to store fat around your belly. Forty percent of women — even a lot of very fit women — have some cellulite on the backs of their thighs and hips. But if you’re starting to notice it on the fronts of your thighs, that’s a metabolic red flag. When your body starts scavenging your muscles for fuel, soft fatty deposits are left behind: cellulite. You also lose collagen and elastin, leaving your skin looking stretched. This can also make cellulite more noticeable, and any body fat starts to look lumpy and distorted. The thyroid is not only a metabolic superstar, it also shares responsibility for healthy skin, hair and nails. Dry, cracked skin — especially cracked heels — is an indicator that your thyroid isn’t as efficient as it should be. Hair loss, particularly for women on the crown of their heads can also indicate hormone imbalance. Your adrenal glands are responsible for telling your body to release stored fat for fuel, particularly as the afternoon drags on. When that doesn’t happen, blood sugar drops and your body signals you to eat something that has quick, easy energy — sugar and simple carbs. But it’s a vicious cycle because those foods don’t provide energy very long. A fast metabolism, however, can regulate blood sugar to give you energy all day, without sudden drops. By doing this changing this ONE habit that costs you about $8 every 2 or 3 weeks you can dramatically increase your metabolism, boost your health, and REVERSE the 7 “signs” of a sluggish metabolism I’ve outlined above. Basically the only difference is the refined coconut oil won’t give you the coconutty taste and unrefined will. I know its technically “more processed” but I’m okay with it and you should be too! You’re probably wondering why you should dump your refined, polyunsatured fatty acid oils and, maybe more importantly how a $8.49 jar of coconut oil will reverse your sluggish metabolism? Ok, since you’re wondering I’ll tell you. It’ll only take a couple of minutes. First, the polyunsaturated fatty acid oils that cause such havoc on your metabolism. If we know that free-radicals cause oxidative damage to our cells, via lipid peroxidation, mitochondrial damage, and inhibiting Glycolysis (ATP production) AND if we know that free radicals are created through oxidation (exposure to Oxygen) AND we know that unsaturated fatty acids are VERY unstable and VERY susceptible to oxidation (light, heat, Oxygen, etc…), then we can conclude that unsaturated fatty acids, especially polyunsaturated (PUFA) cause oxidative damage through excess free radical production. Sesame, nut, seed butter, etc…contain high amounts of defense chemicals (PUFA) and should be eliminated or significantly reduced if metabolic health is important to you. Some people are less affected, but if you aren’t seeing results and continue to have digestive or endocrine issues by eating unsaturated fats, THIS is why! Our requirement for unsaturated, so called, essential fatty acids, is SO LOW that you don’t need to actively consume them. In fact, it’s best to avoid/limit them. A study reported in the Journal of Nutrition found that coconut oil boosts metabolism. Researchers found that participants who consumed two tablespoons of coconut oil per day burned more kilojoules than those who consumed less. A speedy metabolism helps boost the body’s immune system and keep weight off. Coconut oil is one of nature’s most abundant sources of medium-chain fatty acids, and these nifty little triglycerides can work wonders for a sluggish metabolism. In a study that looked at the effect of medium-chain fatty acids on metabolism, it was found that these fats could increase the metabolic rate by up to 48 percent and for up to 24 hours. In obese individuals, the increase was as high as an astounding 65 percent! If your metabolism has been damaged by dieting or stress, a daily dose of coconut oil can stimulate your cellular energy mechanisms to kickstart your thyroid/metabolism. Long-chain fatty acids, like those in polyunsaturated oils, are more difficult for the body to break down and use for energy. Instead, long-chain fatty acids are usually stored as fat in the body. 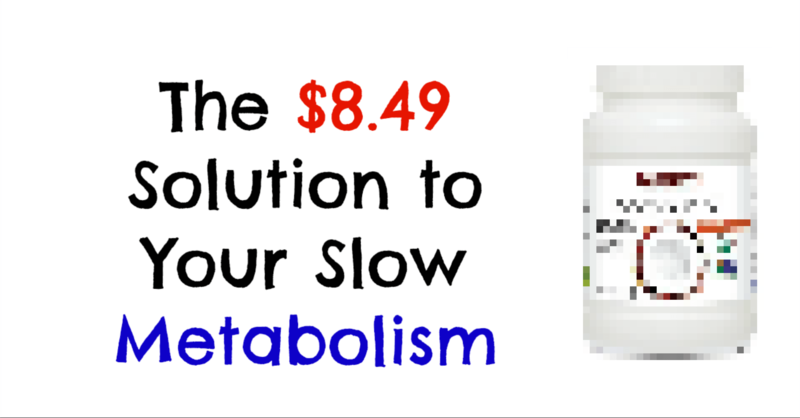 All it takes is $8.49 every 2 or 3 weeks to reverse a slow thyroid, sluggish liver, and struggling metabolic rate. Enjoy your new healthy habit! If you enjoyed this article and are interested in purchasing a jar of coconut oil from Amazon, I’d appreciate you buying from my link, since I make a few pennies for my article writing troubles. If not, no worries. There are plenty of options at your local grocery store. Sign up for updates and more below with your best email address!